Every year the Association of Illustrators run a poster competition in conjunction with Transport for London. I have never entered before, but this year I decided to give it a go and I am thrilled to say my poster is now in the exhibition of the top 100 entries – on show at the London Transport Museum until September. The theme was ‘Sounds of the City’, and I used the wonderful website London Sound Survey for inspiration – take a look, it’s full of fascinating sounds and archive clips. It also has a very carefully compiled section on references to sounds in London in print through the ages, and this is where I discovered a news clipping from 1951, about a baby elephant escaping from New Cross Empire. In its panic it ran into a nearby Post Office, causing customers to vault over the counter and stamps to scatter everywhere, trumpeting loudly all the while. The Post Office staff proudly reported afterwards that they hadn’t lost a single stamp. This delightful story inspired my entry, which I made entirely in collage, using letterpress blocks to print the ‘Parrrump’ sound. I even made my own set of stamps! This entry was posted in Exhibitions on May 20, 2017 by Jane Porter. 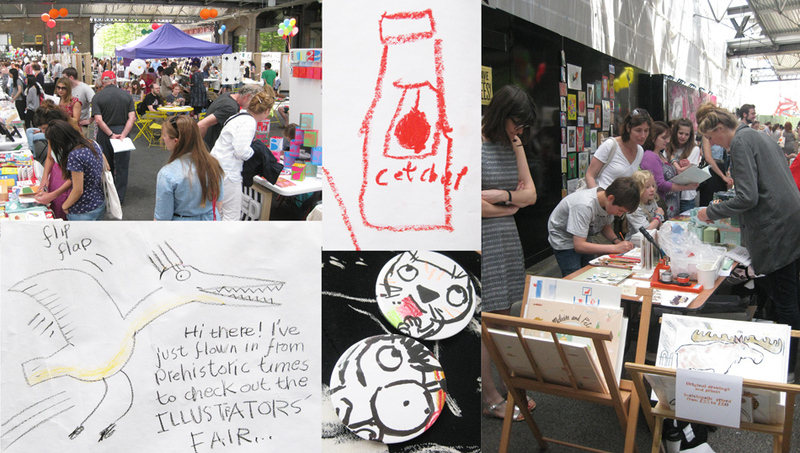 Yesterday was the first ever Illustrators’ Fair, held near Kings Cross in London by the brand new House of Illustration as part of their housewarming season. 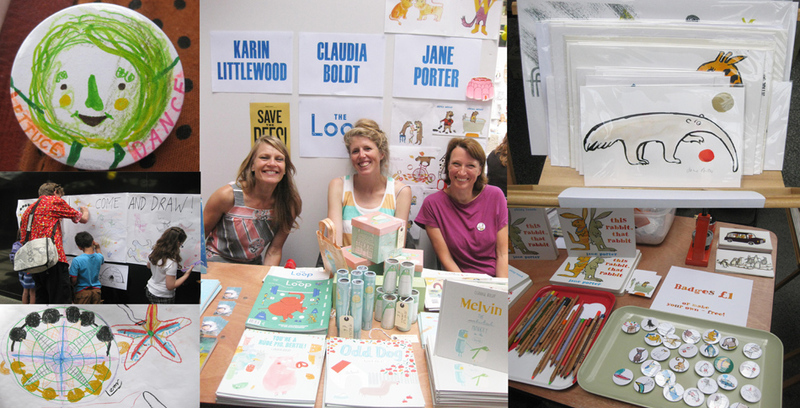 I was sharing a stall with Claudia Boldt and Karin Littlewood, and there were at least 100 other illustrators on stalls, with many many more illustrators, families, local people and illustration fans visiting throughout the day. 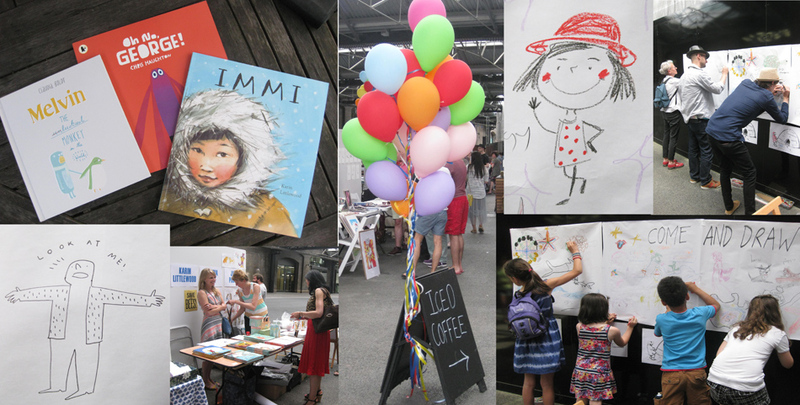 There was a great buzz to the event, with big bunches of balloons everywhere giving it a real fairground feel. We offered free badge-making on our stall which was very popular with children and adults alike – I specially liked Sarah Edmonds‘ ‘Lettuce Dance’ and Bridget Strevens-Marzo‘s Tiz and Ott badges. We were lucky to be opposite a long blank wall, which Karin quickly converted into a wall of drawing, which kept people busy all day – one boy spent ages drawing a beautifully elaborate northpoint, and the ketchup bottle really makes me smile. And I came home with three new signed picture books, all of which will be a perfect starting point for activities at my weekly under 5s art class. Big thanks to Bob and Michael, and all the fantastically helpful volunteers at the House of Illustration for organising this wonderful event. This entry was posted in Exhibitions, General news, Illustration on June 23, 2014 by Jane Porter. The show is on at The Art Cabin, 11 Brookwood Road, Southfields, London SW18 5BL, 10am – 6pm. This entry was posted in birds, Exhibitions, River projects on May 17, 2014 by Jane Porter. My exhibition about the river Thames, Skim Sky Blue, is now open at The Art Cabin and runs until May 18th. Details on how to visit are here (it’s all part of Wandsworth Arts Festival Fringe). I’ve been asked by a couple of people who live too far away to come and see it if I’ll post pictures, so here is selection of some of them. 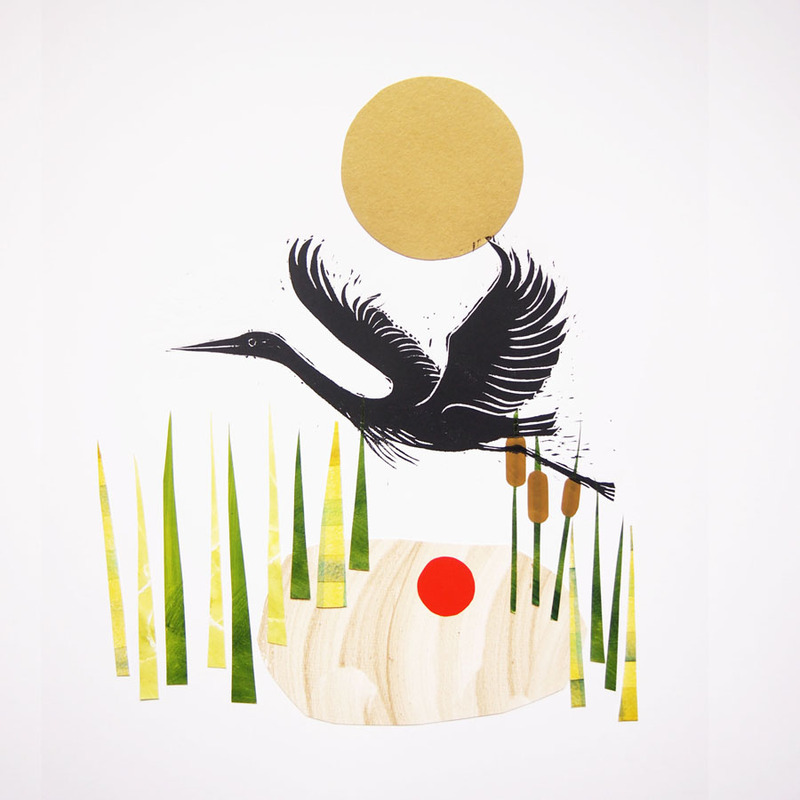 The works are mostly woodcuts with chine collé, and some with additional collage added after printing. I used all sorts of materials for this, from old maps to prepared sheets using both oil and watercolour paint. I had a lovely discussion with Japanese visitor who came into the gallery about the particular shade of deep, clotted blood-red that you can see in the circle on the ‘eels in a tyre’ picture – apparently this is a colour of deep significance in Japan. “Skim Sky Blue is inspired in part by woodcut artist Robert Gibbings’ 1940 book ‘Sweet Thames Run Softly’, in which the author built his own boat then paddled down the river Thames from Lechlade in Gloucestershire all the way into central London, sketching and observing along the way. The beautiful woodcuts in the book celebrate the small details of river life, from the curl of a leaf to the dart of a dragonfly. “Building on a lifetime’s connection with the river Thames, illustrator Jane Porter has explored every mile of the river, from walking to its source under a pile of stones in a buttercup-filled Gloucestershire meadow to the silvery sculpture of the Thames Barrier and the tidal mudflats to its east. She has swum some sections, and has rowed in a traditional Thames skiff from Lechlade 120 miles back to Teddington, as well as skiffing past central London’s landmarks in the Great River Race. She has even built her own coracle and paddled it on the Wandle and a quiet backwater of the Thames. 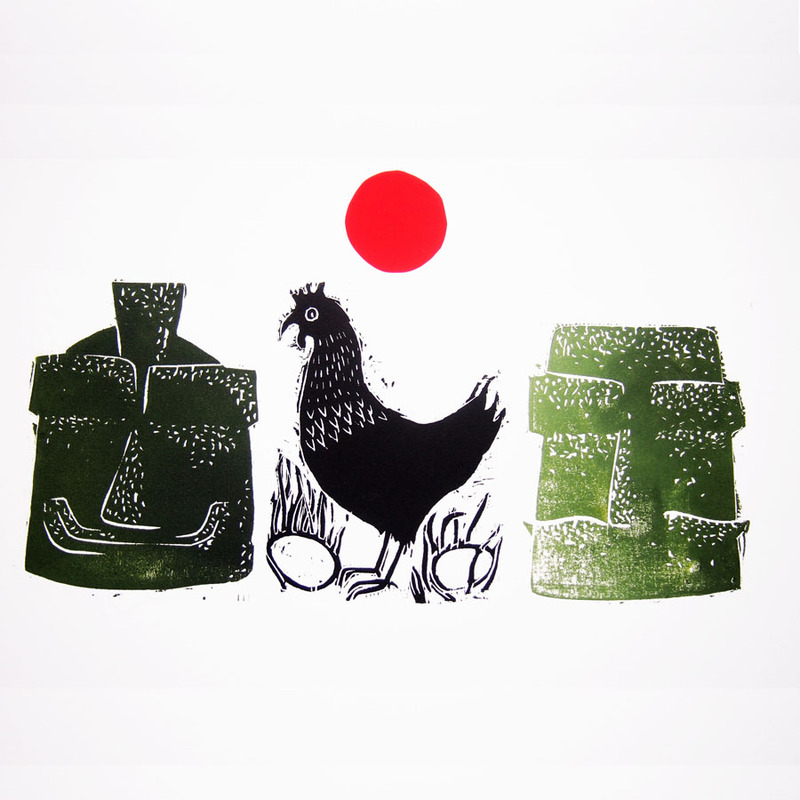 “The woodcuts in this exhibition tell stories about different sections of the river – the quirky Easter Island-inspired topiary patrolled by hens at Radcot Lock, the cormorants proudly occupying their tree at Stephens Eyot near Kingston, the abandoned structure out past the oystercatchers near Erith, scented by the sewage works. As a volunteer for both Thames 21 and the Wandle Trust, Jane is involved in monitoring the health of the Thames and has been hauling tyres and other rubbish out of the river Wandle for ten years – eels are a regular sight in this Thames tributary and have an astonishingly tight grip as you pick them up to return them to the water. The woodcut medium gives the work a very tactile quality: the gloss of the oil-based inks and the slight embossing from the force of the press – even the slight flaws where the wood has splintered – are a refreshing antidote to digitally created or printed pieces. 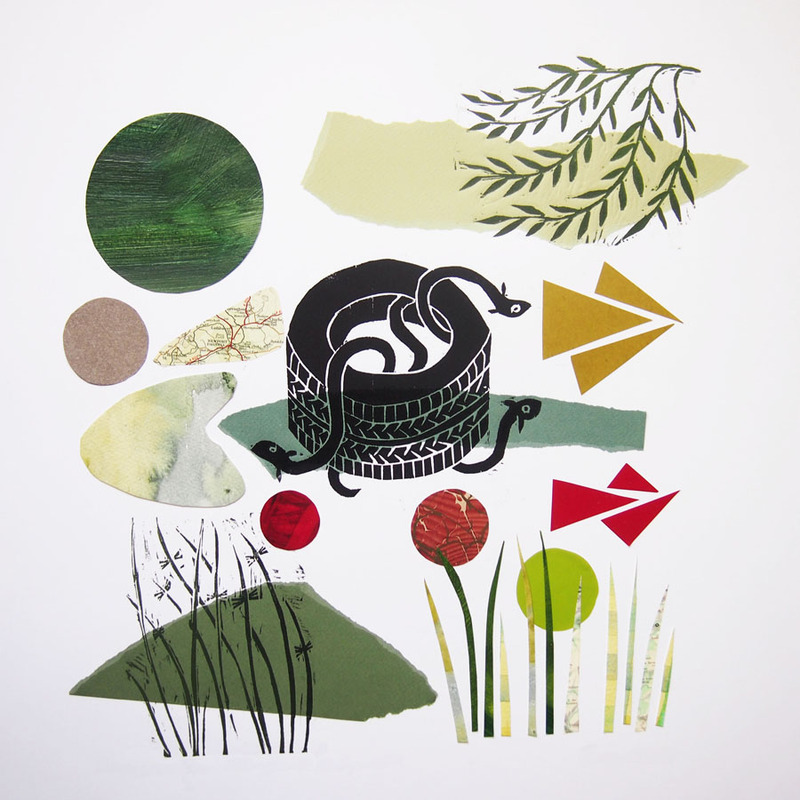 Jane has used chine collé to give graphic highlights and splashes of colour or texture to the prints – using for collage pre-prepared watercolour washes, some even created with mud from the Thames itself. This entry was posted in Exhibitions, Illustration, River projects on May 4, 2014 by Jane Porter. Skim Sky Blue is open! My exhibition of woodcuts and collage inspired by the Thames, Skim Sky Blue, opened last night – thanks to everyone who came along. That’s me in the large orange necklace – it came out of the river Wandle on one of the Wandle Trust cleanups! I’ll post more very soon showing the actual pictures. Do drop in if you’re anywhere near Southfields – it’s just a minute’s walk from Southfields tube station on the District Line. The show is on at The Art Cabin at 11 Brookwood Road, London SW18 5BL every day from now until Sunday May 18th, and it is part of Wandsworth Arts Festival Fringe. This entry was posted in Exhibitions, Illustration on May 2, 2014 by Jane Porter. Skim Sky Blue: nearly ready . . . This entry was posted in birds, Exhibitions, Illustration, River projects on April 25, 2014 by Jane Porter. 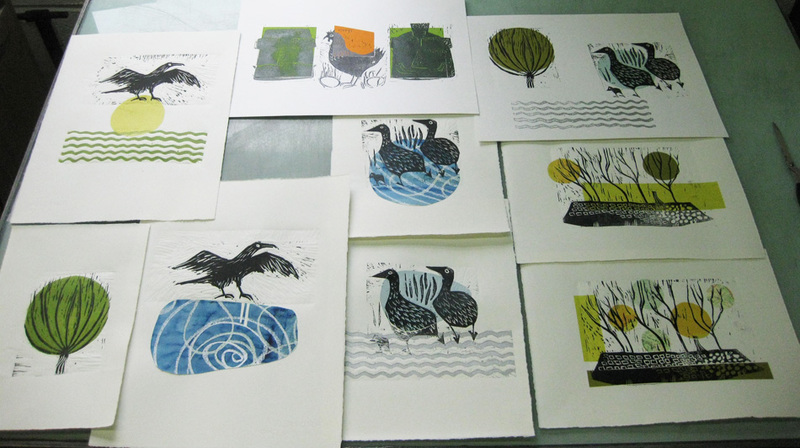 My prints are gradually taking shape for the Thames-themed exhibition I’m holding next month, Skim Sky Blue. I had an experimental day at London Print Studio last week, printing some woodcuts I’d made on a variety of different collaged backgrounds, and trying them out in different combinations and on different types of paper. It was a useful day, and it’s given me lots of ideas on how to progress. One problem I have is that (through spending too much time on the river hauling oars in a skiff) my arms are a bit too strong and I can’t seem to help putting a bit too much pressure on as I tighten the handle on the Beever Press – with the result that everything comes out heavily embossed (you can see what I mean in the picture below, at the right, which shows the back of the paper). I do quite like this effect, but I’m not sure it’s right for what I’m trying to do so for the next session I’ll need to ease off a bit. This entry was posted in Exhibitions, Illustration, River projects on April 7, 2014 by Jane Porter. 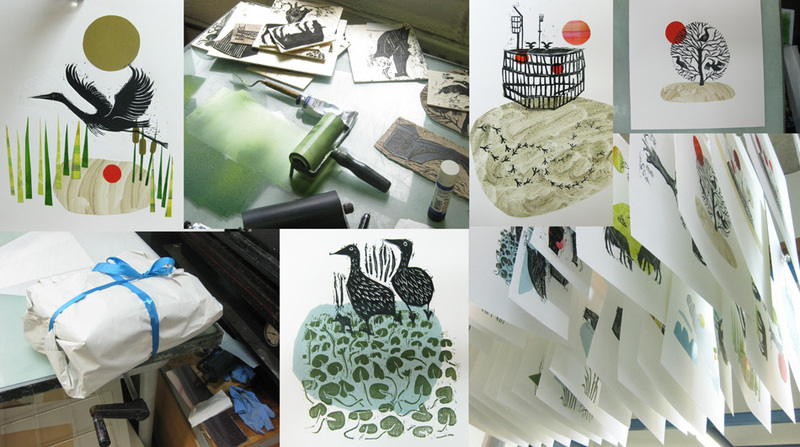 As an admirer of classic woodcut artists like Thomas Bewick and Robert Gibbings, I have wanted to try my hand at the medium for a while – and I got the chance on Saturday at a workshop at the London Print Studio run by printmaker Jonathan Ashworth. I made two blocks, based on photos of reeds and marginals I took last summer on the upper Thames, intending to layer them – though when it came to printing they seemed to work better separately. I tried all sorts of colour combinations and paper types, printing a dark background with a stencil moon for some and for others cutting a fluorescent circle and sticking it to the paper as a background. I’ve done lino-printing before at home, using the back of a spoon to apply the pressure for the print, but using a proper press is so much better – I tightened up the handle quite hard on a few and ended up with a bit of embossing which I like. My original plan was to use the prints as collage materials for my upcoming exhibition, Skim Sky Blue, but I’m now planning to make a lot more blocks (using lino this time), book some studio time at the LPS, and produce some Thames-inspired slightly abstract prints that way. Jonathan showed us a DVD during the lunch break about contemporary woodcut print-makers, and I particularly liked the collage-y abstract approach of Peter Lawrence. An inspiring day all round – thanks Jonathan and LPS. 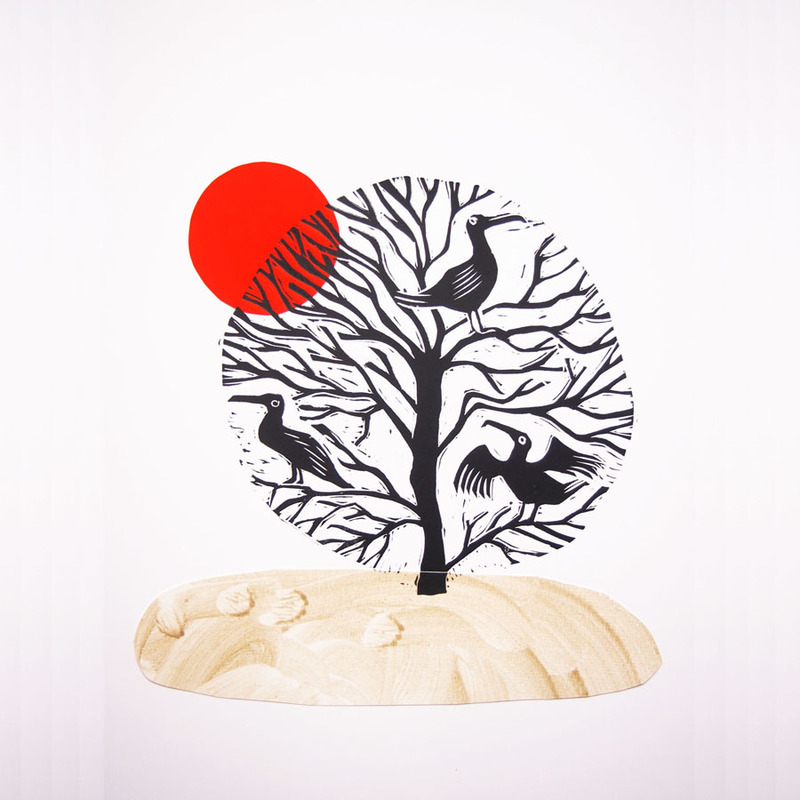 This entry was posted in Exhibitions, Illustration, River projects on February 24, 2014 by Jane Porter. 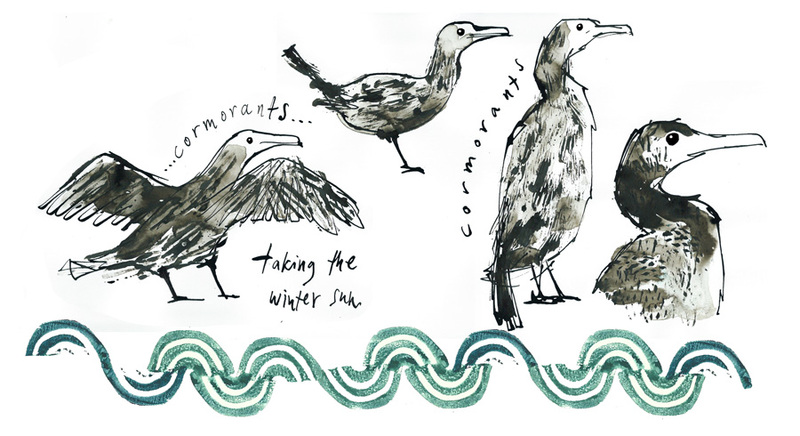 Today is the opening day of the exhibition I’ve worked on with the National Trust at Sutton House, Hackney. Each of the historic rooms features a letter written by historian Miranda Kaufmann to one of nine Influential Black Londoners – and she has done a superb job of bringing them to life in a most engaging way. She has written about the experience on her blog here. I’ve designed and illustrated a set of commemorative stamps, and have created giant envelopes to display them. Visitors will also be able to collect small stickers of each of the stamps as they go round the house taking part in activities related to each of the characters. Many thanks to Daisy and Sean for helping make the envelopes and mount the exhibition. 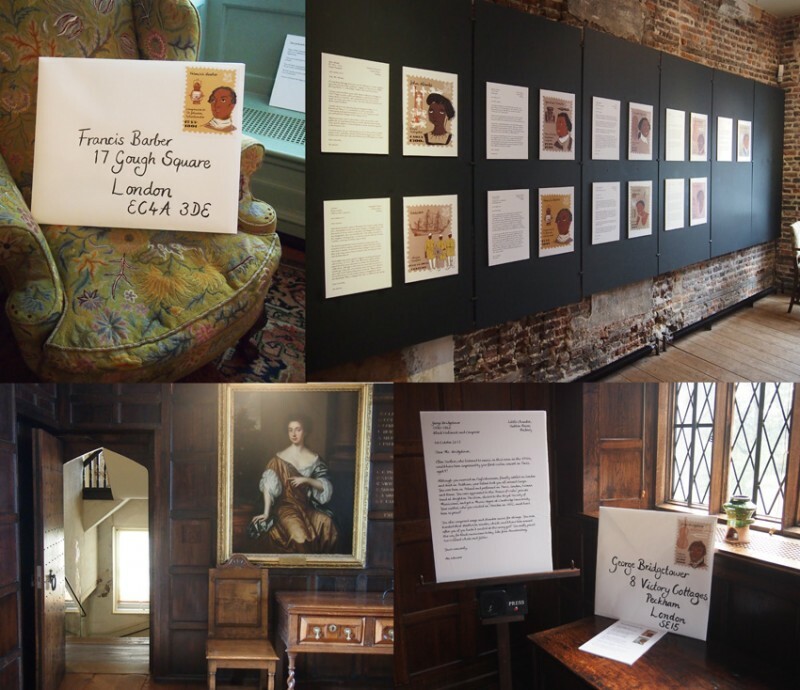 It’s been a great project to be involved in – Sutton House is a very atmospheric and interesting building and it’s a privilege to work there, but most of all it has been fascinating to learn more about the nine Influential Black Londoners and their lives – and how what they achieved and experienced has affected the course of history. In particular I have been reading extracts from Olaudah Equiano’s autobiography, which very vividly depicts his gruelling experiences on a slave ship as a young boy. The next step in the project is the series of workshops with local schools. I’m really looking forward to starting these next week, and helping KS2 children produce some exciting new work, both 2D and 3D, to add to the exhibition. Do get along to see it if you can! This entry was posted in Exhibitions, Illustration on September 29, 2013 by Jane Porter.